In late April, I was asked if I was interested in being part of a blog tour for Halls Cough Drops . I jumped at the chance, since I always carry a small bag of cough drops with me in case my throat gets dry while teaching. I do my best to modulate my voice and speak from my diaphragm, but sometimes I still get a scratchy throat after talking all day. It's especially bad when my allergies are acting up. Allergies have been rotten this spring, and I like these sugar-free cough drops to help moisten my mouth and throat as well as the menthol scent to open up my sinuses a bit. The black cherry flavor was good, and the menthol wasn't too strong. I went through the pack they sent me in just a couple days of teaching. I tend to always end up with cherry cough drops -- I think it's a carry over from childhood! I will continue to keep a pack of Halls cough drops in my bag! You never know when you'll need one. Disclosure: I wrote this review while participating in a blog tour campaign by Mom Central on behalf of Halls and received products necessary to facilitate my candid review. In addition, I received a gift certificate to thank me for taking the time to participate. In college, someone once told me that I had an "intense and ridiculous need to over-communicate." WHY I remember this 13 years later, I do not know, but it seems an appropriate quote to begin my blog with. It's been an amazing seven years. I've met some wonderful people, reconnected with others, worked with some fantastic companies and had many great opportunities thanks to this blog. I'm humbled and grateful. Life has changed quite a bit in the last seven years. We live in the same house, but we've added a pool and a room. We added a 3rd child. We homeschooled the last four years. Bo changed companies a few times. I went back to training and began to get paid for my writing. I know that life will continue to change and as always, we welcome those changes and the challenges they bring. I imagine myself continuing to share many of them from my little patch of sunshine. 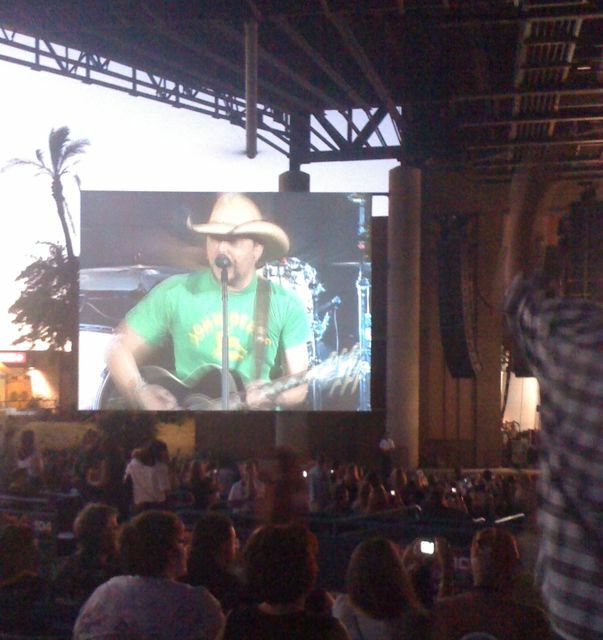 Friday night, Bo & I had the pleasure of going backstage with Jason Aldean, and then enjoying his concert (as well as Brooks & Dunn!) at the Cricket Pavilion. 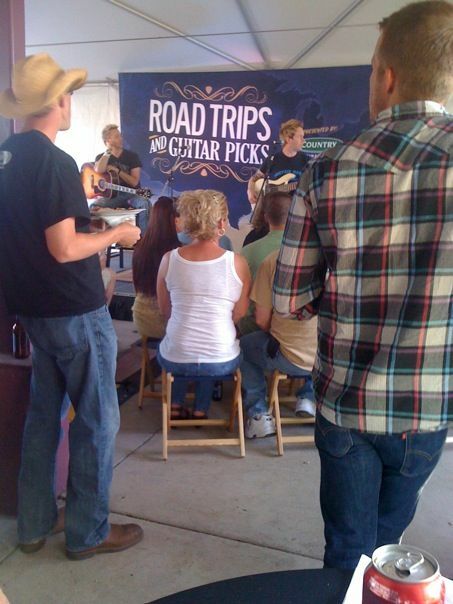 We were the guests of Country Financial and their Road Trips & Guitar Picks program, and we had a fantastic time! The night started with heading to a backstage area where they were serving delicious appetizers and drinks. We grabbed some food and chatted with some of the other people that were there thanks to Country Financial. 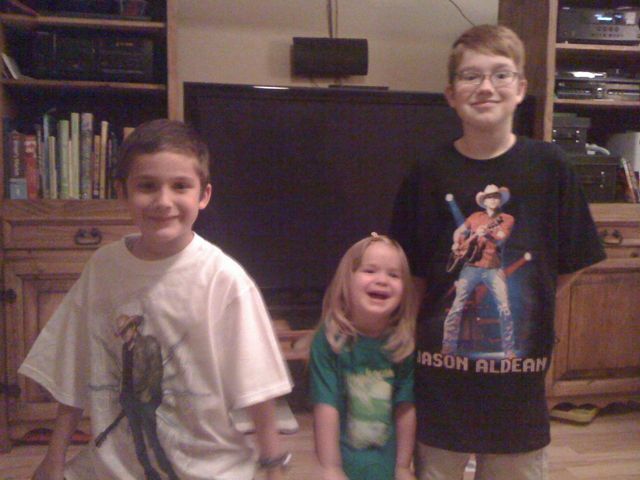 We had the chance to have our picture taken with Jason Aldean -- who was a very sweet, friendly young man. After everyone had the chance to have a picture with Jason, he and 2 of his band members treated us all to a private rendition of "Big Green Tractor" and then did a brief Q&A session. He shared that his musical influences were Alabama and Lynrd Skynrd and also that his dad helped him learn guitar chords by writing them out on a piece of notebook paper. He headed off to get ready for his concert, while we ate a few more appetizers and had another drink. 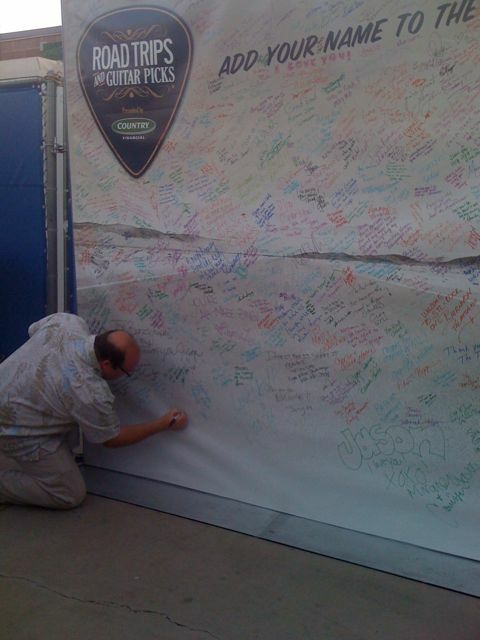 We signed the big poster for his concert tour. Soon, we were encouraged to head to our seats so we did. The Cricket Pavilion is an outdoor venue, so I was glad we grabbed a couple water bottles to take to our seats! We sat next to the nicest couple (he is a VP at Country Financial, and his wife was so friendly & fun! I really enjoyed sharing the concert with them.) and thoroughly enjoyed the concert. Jason and his band were full of energy and full of smiles throughout the concert. Everyone enjoyed their music and there was plenty of dancing and singing along. 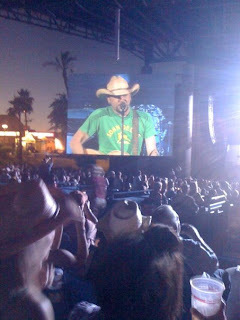 The songs that seemed to have the biggest crowd reaction were "She's Country" and "Big Green Tractor." It was fun when they ended their set with Kid Rock's "Cowboy." We had an absolutely wonderful night, and feel very fortunate that we were given this opportunity. The only thing that could have made the night better is if our kids could have joined us. They all love music, and I think Nate would have been in awe of Jason's acoustic guitar. We did get them t-shirts, though, which they were happy to model! 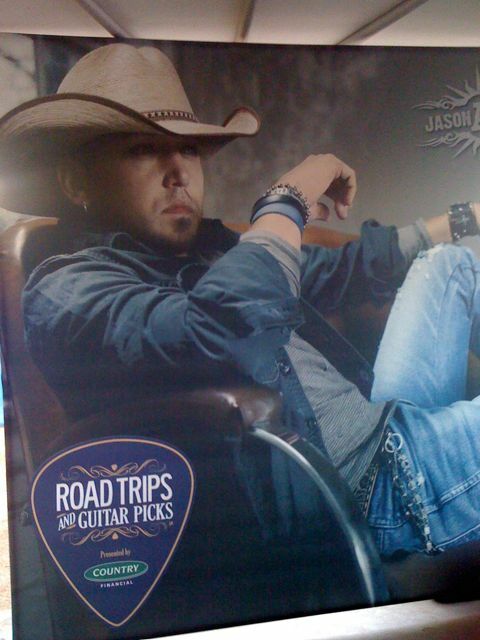 You can visit the Road Trips & Guitar Picks website and enter for a chance to win a trip to see Jason Aldean or Jewel in concert! I know you would have a fabulous time! Also, visit the website for information about both artists and backstage information about their concerts. With a name like YourSphere, it makes sense that you would find individual "spheres" within the social network. Similar to groups in other social networks, spheres are broad categories (Gaming, Performing Arts, Photography) with smaller spheres within each larger sphere that are created by users. I logged in as myself to check out the spheres, and found out that as an adult, I wasn't able to join or create any spheres. The spheres are strictly for those 18 and under. I was able to look at the information in the spheres, and found pictures, videos and many comments. I asked the boys if they had visited any spheres, and they hadn't. Nate and I took a few minutes to look at the spheres and he chose to view the Performing Arts Sphere. He found some of the pictures interesting, but said he didn't really "get" what they were. We noticed a video that offered some explanation, so he clicked on that and watched the explanation video. The video did a nice job of explaining spheres, and he looked at the sphere for a couple minutes after the video ended. Then he said, "Hmmmm. But what I prefer to do is play games." He spent about 15 minutes playing some of the games available on the site before heading outdoors. So far, I'm finding that my boys are not interested in the anonymity of an online social network. They definitely enjoy playing computer games, and are happy with the choices available. They are not so interested in anything else the site has to offer so far. Colin did ask some of his friends at his enrichment program if they knew about the site, but none had. I told him I'd share the info with the moms I knew to see if kids he knew might join. The first thing we needed to do to get started on www.yoursphere.com was to set up our accounts. I set up the parent account first, which was fairly simple and straightforward. Once that was done, we set up accounts for both boys. The profile information for the kids included information about what they liked to do, favorite books and movies, and other interests. Some of the items the boys had ready answers for, others they chose to skip. They each chose usernames that were not their own names, which I found amusing. Once the child accounts were set up, I had to activate their accounts before they could begin playing around in YourSphere. One thing I found a bit annoying (and so did my boys) was the video that popped up when you first visit the site. I'm sure she's a popular teen singer, but we don't know who she is. The fact that music immediately began to play when hitting the site is what annoyed me, but the boys did not appreciate her song about kissing. It was suggested that we find some friends on the site, but my boys were only interested in playing the games that were available. When I suggested finding friends, they wanted to know who they knew (in real life) that were members. Since we don't know anyone (yet), they had no interest in friend-ing strangers. I am just fine with that, and didn't encourage it beyond suggesting they friend each other. If we do know you in real life, and you're interested in joining up, I'm sure the boys would be happy to friend you! Our unique referral code is YSMC-0057, so feel free to use that when registering at www.yoursphere.com. You may have guessed that I spend a lot of time online. Some of the consulting/training that I do is about social media and I share different strategies with parents about handling kids and the online world. Some parents choose to ignore the online world and prevent their children from learning about it at all -- which I believe is a mistake. I would rather kids/teens learn about social media and spending time online while still at home so they can be guided and taught. I never threw my kids into a swimming pool and assumed they would figure out how to swim. I went in the pool with them, I held them in the water, I taught them how to make their first swimstrokes. In the same way, I think parents must guide their kids through the new opportunities and media that is out there. I do understand that some parents ignore it because they don't understand it themselves, but I always encourage those parents to get out there and paddle around! 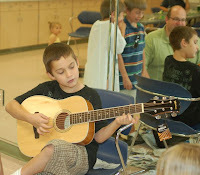 One of the sites geared towards kids is www.yoursphere.com. I was recently asked by YourSphere and Mom Central to check out the site with my boys (ages 8 & 9) and share our experiences here. Watch for posts in the next few months about what we think of this site. 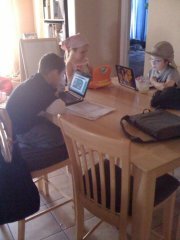 My boys email a few people, and enjoy playing a few online games. They also did the bulk of their schooling this year via an online curriculum. I'm curious about this social network for kids and eager to share what we all learn over the next few months. I have to thank Country Financial and their Trips & Picks program for date night tonight! It's been too long since Bo & I have been out alone together, and May has been a rough month. I'm really looking forward to the backstage experience with Jason Aldean, and then enjoying a high-energy concert while seated next to my honey. It's been touch & go about tonight, but I'm glad that I'm finally feeling better and my sweet sister is willing to watch the kids even though Nate is not feeling well. My husband cleared his calendar of evening appointments, so we are set to have fun! Check back this weekend to hear about the experience. How many times have you seen those "Seen on TV" products and wondered if they worked the way they seem to on television? I know that I often wonder just that thing, so I was thrilled with the chance to review the Grill Daddy. The idea is that steam allows you to easily clean gunk and crud off of your grill. We use our grill ALL THE TIME. You'll find Bo grilling something every month of the year. He has a few brushes to clean the grill, but it always seems like a lot of work and he never does it as often as he probably should. We received the Grill Daddy and put it to the test right away. I liked the fact that it was pretty simple. No batteries, no complicated pieces to put together. It comes out of the box ready to use (except for adding water) I filled it with water and Bo pre-heated the grill. As you can see in the video below, it worked great! We were impressed with how easily it took off baked-on food and couldn't believe how clean the grill was with very little effort. If you're looking for a Father's Day gift, I recommend the Grill Daddy. 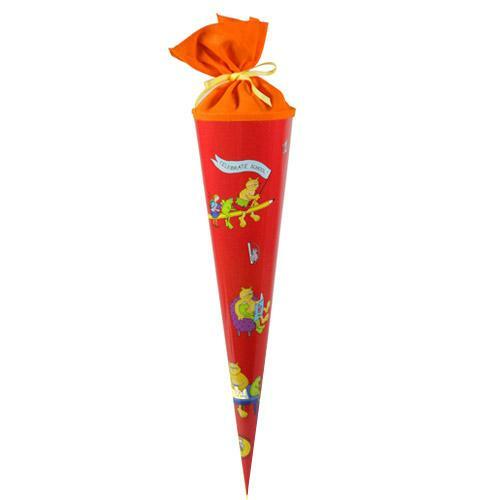 For less than $20, it'll be a favorite gift this summer! I will freely admit that I am pretty choosy about what to spend my Tropicana Juicy points on. Some things have no interest for me or my family, so I haven't thrown my points towards events that didn't interest us. A trip to Kennedy Space Center, though? I'm all about trying to win that trip!! Even better is the fact that I didn't have to use any of my points to enter the sweepstakes. The trip is for a family of 4 (I'm guessing I could pay the necessary extra for Lydia -- although I learned my lesson and will read the rules carefully to make sure!) It includes 2 days at the Space Center, lunch with an astronaut (oh, my boys would be beside themselves! ), round-trip air, hotel & rental car. You have until May 31, 2010 to enter, and the winner will be chosen June 1, 2010. There are more great prizes coming up, but this one seems like it was created just for my family! Disclosure: I wrote this post while participating in the Tropicana Juicy Insiders Ambassador program by Mom Central on behalf of Tropicana. I received 12 free Juicy Rewards points and a $50 Visa gift card to use in redemption of the points and to facilitate my review. Last week, I checked my email and read an email that said "not sure if you even like country music," and I laughed! I DO like country music, and listen to it quite a bit! Years ago, I wouldn't have ever thought I'd become a country music fan, and even remember making fun of friends who were. And, yet, something about it drew me in and I had an open mind when a friend encouraged me to listen and now I find myself turning to country music quite often. 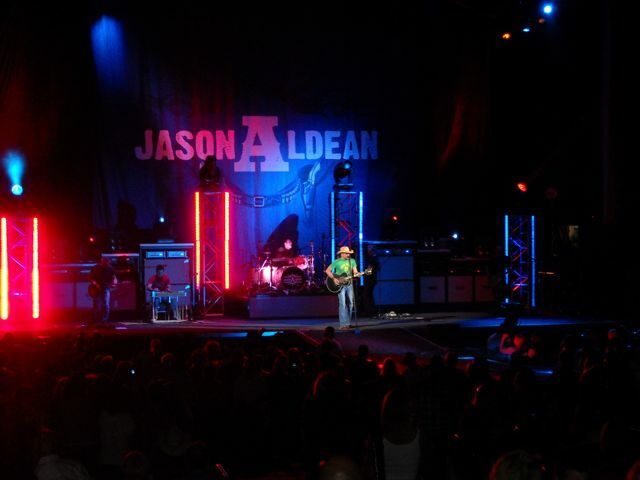 So, I was very excited to hear that I was being given the opportunity to see Jason Aldean in concert this week, as well as visit backstage! I've never been backstage at a concert, so I can't wait to have that experience! 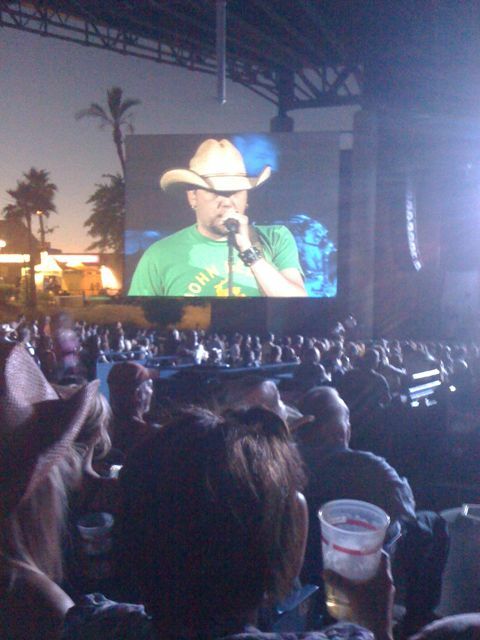 He'll be at the Cricket Pavilion in Phoenix this Friday (May 21) as the opening show for Brooks & Dunn. 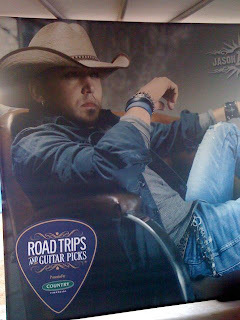 Country Financial is sponsoring the Trips & Picks website, where you can find information about Jason Aldean and Jewel in concert this year. There is tons of great information at the site, giving fans a chance to be behind the scenes even if they can't make a show! Bo & I are looking forward to an evening out, as well as our first country music concert together! I have read that it's a great show, and I'm looking forward to enjoying a memorable night. I'll probably tweet from the concert, so if you're on Twitter, feel free to follow me @AZMelly! Small cars that zip across the floor have always been popular here. Small cars that zip across the floor and flash multi-colored lights have been uber-popular here the last couple weeks! All 3 of my children (Lydia, 3; Nate, 8; Colin, 9) have had a great time playing with a set of Marble Racers we recently received. These fun, little cars are clear and come with a set of stickers to decorate the car's body. With designs like Cat's Eye, Volcano, and Police Car -- there is something to please every child! My kids all had to decorate the cars first, and then set to making them crash into each other and race across the floor. The flashing lights are definitely unique, and brought an extra level of fun to the toys. The bottom of the car has a large marble, which allows the cars to go pretty quickly. These cars received a thumbs-up from all my kids! They are currently available at CVS Pharmacies in AZ, NV and CA; as well as Flying J and AC Moore stores. They retail for $7.99 each. Until May 21, 2010 you can buy one and get one free! All the details can be found here, but basically purchase a car and then send in your receipt and request for a second car. You must purchase from a CVS Pharmacy to redeem this offer. Mandatory Question: Which Marble Racer is your favorite? Good Luck! Giveaway will remain open until May 25, 2010. Winner will be drawn on May 26, 2010 and notified via email. They'll have 48 hours to respond, and then I'll choose a second winner. Entries that do not include valid information, or the answer to the mandatory question will be discarded. I've been collecting Tropicana points, and had grand plans to use a bunch of them for an outing with the kids. But, then, my parents extended their stay. I was offered a couple extra classes. I got sick, and have been down with pneumonia. So . . . I was glad that I read carefully that the certificates must be used within 14 days and didn't redeem my points before I knew we were ready to get in the car and go! Today, I was looking at the Coleman site, and saw these great chairs. 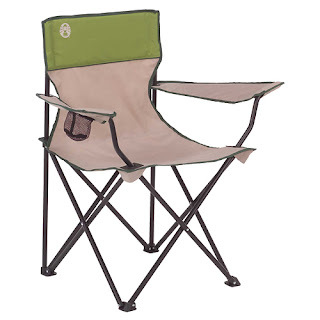 My 11 year old camp chair finally broke during soccer season, so I've been on the lookout for a replacement. For just 6 Tropicana points, I was able to receive a 20% discount and I'll be set once basketball season starts in a few weeks! Now, once I get healthy, we'll use more points to have that great outing I have been thinking about! What have you used your points for? I'd love to know! Disclosure: I wrote this review while participating in the Tropicana Juicy Insiders Ambassador program by Mom Central on behalf of Tropicana. I received 12 free Juicy Rewards points and a $50 Visa gift card to use in redemption of the points and to facilitate my review. BUT, back to the LeapFrog Tag Reading System ! When my boys were young, they had LeapPads that they loved. I remember they were a big investment (like this system) but they had years of enjoyment from them. From the description of the Tag, it sounds like I have to be more involved than with the LeapPads. Each Tag holds 10 books, and if you happen to have more than 10 Tag books , then you need to swap them out via computer. I do like they have books that would interest her -- like Olivia , Fancy Nancy , and Disney Princess books. I know it's not a replacement for reading to her, but I'll be honest and say that we read quite a bit in this family! I think she would love the independence this system would give her. So -- readers -- do you have a LeapFrog Tag reading system ? Tell me your pros & cons! After having to physically remove her last night from the display at Target, I'm leaning towards buying her one, but would love to hear your thoughts! This week is National Stuttering Awareness Week. Earlier this week, I posted a video of Nate presenting some information about stuttering. He has come so far during the last few months and we are very proud of him! His speech therapist has helped him be more aware of his bumpy speech, and has provided him with tools for smoother speech. He knows that he needs to relax, breathe deeply, stretch out the first sounds for some words, and remember to pause during long phrases or sentences. More importantly, he also knows that even if he tries to do all those things, he will still have episodes of bumpy speech. It's a long process, and he will probably have to be aware of it for the rest of his life. One thing that has encouraged him is learning about famous people that have also struggled with stuttering. Did you know James Earl Jones, Julia Robers, Darryl Sproles, Joe Biden and even Lewis Carroll stuttered? The Stuttering Foundation has a great list on their site of famous people who stutter. They also have a number of free brochures that can be downloaded with information about stuttering. The National Stuttering Association has local group meetings that we will look into this fall (they don't meet during the summer.) They have a video on their site right now of a recent interview with Joe Biden on The View, where he talks about growing up with a stutter. I found it interesting, especially that he was still embarrassed about it as an adult. I am so very proud of our son and the effort he has put forth in working on his stuttering. It has never stopped him from speaking to others, and he is a very happy, friendly child. I have definitely noticed that he does talk with his peers more often now that he has been learning how to control it more. It still breaks my heart, though, when I hear kids make fun of him, or talk behind his back. Everyone has their quirks and differences -- and I would hope that parents would help their children learn to accept others as they are. I'm happy that Nate is learning to stand up for himself more often, and is excited to help others learn about stuttering. If you know someone who stutters, Nate says the best thing you can do is to let them talk. Don't interrupt or finish their sentences for them! It also doesn't help if you tell a child to slow down. It's not that they have to slow down; it's that their brain and their speech machine has had a disconnect somewhere along the line and needs a moment to reconnect. He says the best thing you can do is be a friend. I took this picture Wednesday afternoon as I was driving home. I was about 4.5 hours from home, so I was looking at a long drive to get there. This represents some of the changes on the horizon for our family. I alluded a few weeks ago to some changes, and me traveling for work is one of them. 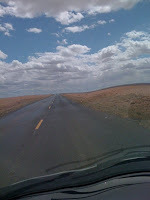 At the time, I was thinking of one potential client -- but this trip was for another client. At the time, I didn't know travel was a possibility with them, but sometimes when you decide to open yourself up to more possibilities they begin dropping into your life. This trip was the first business trip I'd taken in about 12 years. It took me to a remote part of our beautiful state, and allowed me to take in the gorgeous scenery that fills our state. I still don't understand people who insist the desert is brown and boring. This time of year, it's a beautiful, lush green that is punctuated by interesting mountains. I truly love Arizona. Before agreeing to this trip, I talked with Bo, and he was fine with it. Until a few days prior when he admitted he was bit nervous about me going alone. And then the day before he told me he was going to follow me to make sure all went well. His concern was sweet, and understandable -- I've never taken a solo road trip since we've been together and I spent the first 5 or 6 years of our time together with a fear of freeways (it came on, hung in for a few years, and I'm mostly over it now. Odd) In the end, though, I drove myself and he stayed home with the kids. It was a good trip. I stayed at La Posada, which is one the last Harvey Girls hotels and was designed by Mary Colter. It was charming and quaint, with a good (albeit pricey) restaurant. I had the pleasure of changing rooms each night. At first, I thought that would be a hassle, but it turned out to be quite fun. I was able to experience their Standard room (rather small, with just a shower), their Standard Plus room (a bit larger, with a tub and shower) and finally their Howard Hughes room. That was a treat since it was very large, with ample seating and a jacuzzi tub. The training went well, and it's always fun to have students for more than a single day. Most of the time, I teach one-day classes, so it's nice to get to know them over a few days instead. And then I drove home. To my waiting family, all of whom survived without me for the duration. Changes require stretching, and I'm glad we're all willing to stretch with life! Today kicks off Stuttering Awareness Week! As many of you know, my 7yo has a stutter and started speech therapy this year to help him learn the tools he needs to control his stutter. As part of the sessions, his speech therapist helped him put together this presentation. If you have any questions for Nate about his stuttering, or stuttering in general, please feel free to leave them in the comments below. I'll have him respond in a future post! When my sister discovered her new food allergies, I thought immediately of Whole Foods Market. I know they sell food that is healthy -- free of chemicals, fake stuff, antibiotics, etc. Whole Foods was definitely on the short list for grocery stores full of things she could potentially eat. We were lucky enough to have a personalized tour a couple Saturdays ago with Dusty, who works in the Whole Body section. Dusty is a wonderfully warm, energetic, informative woman who also happens to cope with her own set of food allergies. Dusty danced us through the store and showed us item after item that Jane could successfully add to her diet. She did it with enthusiasm, humor and a big dose of information. 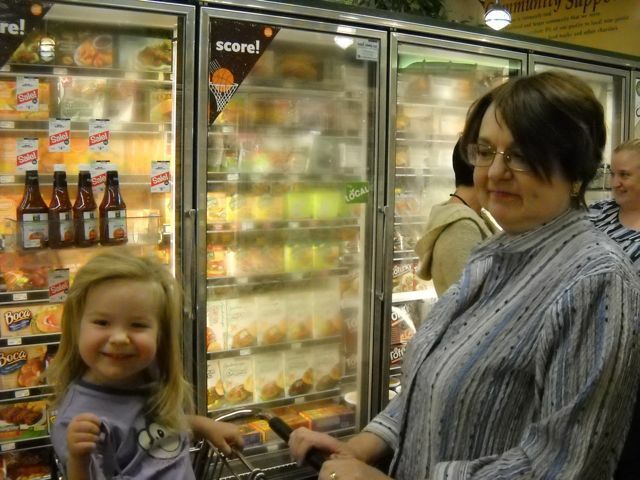 Our mom was in town that week, so she and Lydia joined us on the tour. She was amazed at how many things were available that fit into Jane's limitations and was glad that she was able to go with us. She also commented on Dusty's positive attitude and how refreshing it was. Some of the surprises -- there's a sour cream that meets the allergy requirements! There are 2 dairy-free cheeses that don't have yeast as an ingredient! Rice milk chocolate tastes REALLY good! I had sent over a list of Jane's food allergies prior to our tour, and Dusty did her best to accommodate them all. Because Jane is allergic to citrus, as well as yeast, that means that vinegar is out, as well as the common vinegar substitute -- lemon juice. 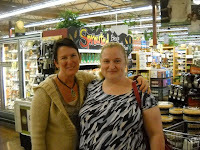 She showed us some wonderful flavored olive oils that could be used as a salad dressing without vinegar. We all appreciated the honest evaluation of products that Dusty showed us. If something may require an acquired taste, she let Jane know. She also encouraged her to add coconut to her diet to help build up her potassium levels, since she is allergic to bananas. She showed us her favorite coconut milk (in the refrigerated section) and also shared that there are other options that are shelf-stable. 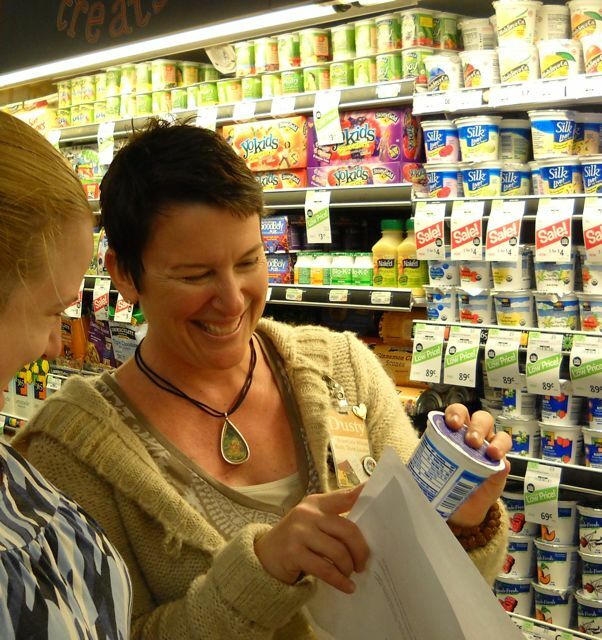 While the prices of specialty foods are higher, they are available at Whole Foods and many can't be found elsewhere. I know people often lament that the store is expensive, but if you purchase items from their 365 brand, they are comparable to other stores. They have a wonderful produce section, and the prices for in-season fruits and vegetables are comparable and sometimes even less. Once again, I was blown away by the friendliness of staff. 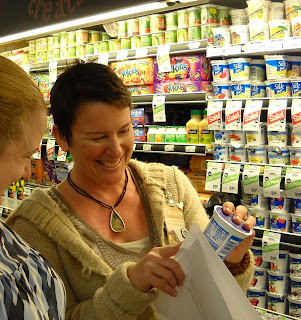 The store is such an inviting place to visit, and everyone is eager to help. In the car later, we both said that we could have wandered around the store for 2 hours and never found 1/2 the products that Dusty pointed out. Jane left feeling more encouraged and a little less overwhelmed than when we walked in. So, I count the visit as a success!! I offer many, many thanks to Dusty and all those at Whole Foods that helped make it possible. 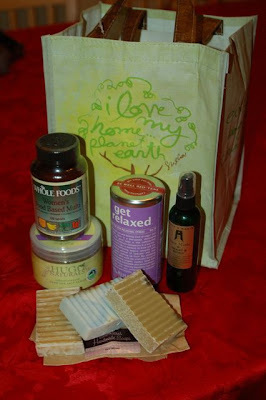 I will share reviews of different products in the coming weeks, as I'm sure you're all eager to find out what she's tried! This was a different homeschooling year, as we depended on the district's online curriculum for the first time for the bulk of the boys' learning. We knew I would work more this year, and thought it would be a good tool for us so I would have less planning and the boys could be more independent in their schooling. They both did very well, and we are getting ready to put a wrap on this school year as they have completed all the necessary work to advance a grade level. It has been challenging some weeks as my hours have been steadily increasing, but they have put forth strong effort and have stayed well ahead of the requirements. They have finished up their work with a month left in the school year! They both have recently expressed an interest in learning Latin, so I have purchased a Latin reader and workbook that they can do over the summer. It's wonderful to see their enthusiasm for learning, and this desire for learning Latin came from them alone -- as I had only briefly considered it a year ago. This ends our current homeschooling journey. I feel sad in many ways about this decision, but we have always said that we would take it one year at a time. We have made the decision to enroll them next year at our local public school. Contrary to what people assume -- it is NOT because I think they are getting too old for me to teach. It is NOT because I am tired of teaching them at home and think it's time they get out of the house and my hair. It is NOT because they don't have enough opportunities to socialize. I am perfectly capable to continue teaching them all they need to learn, and helping them find the knowledge they seek about pretty much any subject. I love helping them learn, and consider it one of my greatest triumphs that I helped both of them learn to read. I enjoy spending time with my children, and will miss the hours we've spent together. My boys have some very good friends, and are perfectly capable of carrying on conversations with a variety of people. The simple truth is that our family dynamic has changed, and my increasing workload has brought us to the decision that they should enter school in the fall. We're hoping that this allows us more free family time, without lessons squeezed in after work and on the weekends. The scheduling of Nate's speech therapy will be woven into his school day, and we won't have to juggle appointments to get him there. Homeschooling worked best for us the last 4 years, but it's time for a change. I will miss it, but I'm excited to be with my boys as they have new experiences and opportunities. We will continue to provide multiple opportunities for them to learn, and will continue supporting their quest for knowledge in every way we can. In no way will I ever abdicate my responsibility for their education. For now? We're going to celebrate the completion of another great year. I haven't quite figured out what that celebration will be, but it will be a big one as this is a major milestone for us all.